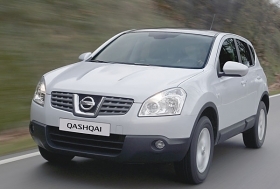 Nissan increased year-on-year Qashqai sales 35 percent in June to 23,852. Nissan Motor Co. and Renault SA were among the big winners in European sales in the first half. Helped by strong demand for the Qashqai crossover, Nissan's six-month volume increased 32.4 percent to 211,821, according to data from industry association ACEA. Nissan increased year-on-year Qashqai sales 35 percent in June to 23,852. In the first half, Nissan sold 117,270 Qashqais, up 56 percent from the 75,122 units sold in Europe during the same period last year. “Qashqai volumes are still booming and the arrival of Juke strengthens the Nissan crossover family with more than 15,000 pre-orders in one month," Bernard Loire, Nissan's vice president of European sales operations, said in a statement. Renault is getting a lift from its Megane compact and Scenic minivan while the Duster SUV is helping Dacia's sales. When combined, the French-Japanese alliance partners had a 13.3 percent share of the European market in the first half, up from 10.9 percent in the first half of last year. By comparison, Europe's second-largest automaker, PSA/Peugeot-Citroen SA, had a 13.7 percent European market share in the first half. Volkswagen AG's seven-brand group was No. 1 with a 21 percent share. Nissan and Renault are bucking a downward trend in European new-car registrations that hit Fiat S.p.A., Ford Motor Co. and Toyota Motor Corp. hard in June, leading to a third consecutive monthly decline as demand continues to drop following the end of government scrapping incentives. June registrations fell 6.2 percent to 1,383,445 vehicles from 1,475,543 a year earlier, ACEA data shows. First-half deliveries rose 0.6 percent to 7,495,520. European demand is sagging as governments withdraw or reduce sales subsidies that were on offer last year to help the auto industry through the economic crisis. Fiat Group recorded the biggest June decline among the major manufacturers, with sales falling 20.4 percent. Ford's registrations, combined with Volvo's, tumbled 14.8 percent, while Toyota/Lexus dropped 12.4 percent. Germany's plunge contributed to an 8.1 percent sales drop for Wolfsburg-based VW, while Italy's 19 percent market decline weighed on Turin-based Fiat. French new-car demand fell 1.3 percent in June, outpaced by a 5.0 percent sales slide in Europe for Paris-based PSA. Renault/Dacia bucked the decline with a 3.8 percent gain in June. Renault now expects Europe's car market to shrink by 7 percent to 9 percent this year rather than the 10 percent it predicted in February, sales chief Jerome Stoll said July 8, joining the ranks of industry analysts and executives who have moderated their forecast declines. Ranjit A. Unnithan, a European automotive analyst with JPMorgan Chase & Co. in London, last week trimmed his forecast market drop for western Europe to 6 percent from 9 percent. The market “is tracking better than expected on most fundamental metrics,” he said in a July 13 note to investors. “Scrappage incentives have not distorted the new-car market as much as feared,” Max Warburton, a London-based analyst with Sanford C. Bernstein analyst said in an e-mail July 15.